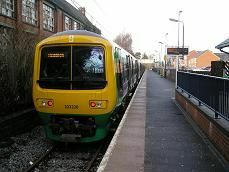 There are two trains an hour to Redditch which start at Four Oaks in the north west of Birmingham. Yet the return trains go all the way to Lichfield Trent Valley. I get on the train at Birmingham New street which leaves at 13.44 and passes through the south western suburbs of Birmingham stopping at the following stations:- Five Ways, University, Selly Oak, Bourneville, King's Norton, Northfield and Longbridge. The London Midland units have nice green covered seats and are reasonably new, having been introduced in 1993, though refurbished in 2007-8. They also have four TV screens in each carriage, giving out the message, "Screen FX", though one of them isn't working today, plus there aren't any programmes or news items showing. From King's Norton onwards its four tracks until Longbridge, then three to Barnt Green, though the two fast lines in the middle aren't electrified. Barnt Green station has four platforms, platforms 3 and 4 for Redditch and 1 and 2 for Worcester. After Longbridge we are in the countryside and Barnt Green is really just a village. The Redditch platforms curve to the left and have a shelter on each platform. We leave on an embankment with houses on the left below us and countryside on the right. We move slowly onto a single track and start to increase our speed. We go into a low cutting where the branches of the bushes have been recently cut back. Then open fields appear on both sides, with an unusual looking Tudor style house on the right. Then it's another cutting as we go under the M42, before we start to curve to the right and then the left. We cross over the Birmingham and Worcester canal and then houses appear on the left as go onto an embankment and then slow for Alvechurch, which is in a cutting. It has a modern single platform with an aluminium shelter, which has been vandalised. We stay in a low cutting and speed up to around 60 mph as we enter wide-open countryside. It's just empty fields with some low hills in the distance. It's mainly farms, though there is a row of houses on the left. The ride is very smooth as we enter another cutting and then start to slow down. First, its houses on the left, then a large factory on the right belonging to the "Mettis Aerospace Group". The line bends to the right as we enter another low cutting. There are then some light industrial units on the right and housing on the right, indicating that we are now in Redditch. We pass what looks like an old station platform on the right, before we slow and stop at Redditch station. It is a newly built station (in 1993) and has a single platform with a shelter. A station building housing the ticket office and a newsagent is at the end of the platform. It has a car park right next to it and is bang in the centre of the town, The line originally went onto to Stratford-upon-Avon and Evesham, but this was closed down in 1964. We actually arrive about three minutes early, but leave again on time at 14.27.